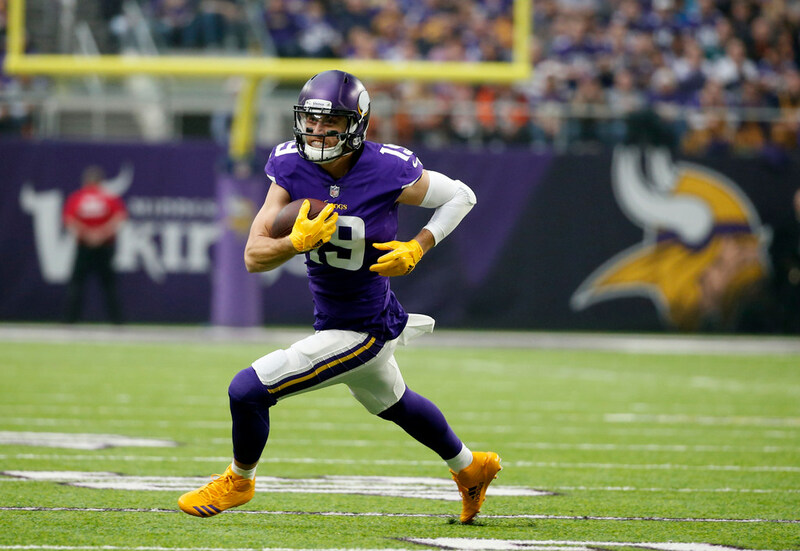 Five of the seven “explosive plays” in Sunday's game were products of the Vikings’ speed and play designs, particularly involving running back Jerick McKinnon and receiver Adam Thielen. Mike Zimmer entered the Vikings’ 34-7 rout of the Bengals on Sunday with plenty of inside information on a Cincinnati defense still maintaining his fingerprints. Add a banged-up Bengals linebacker corps unable to keep up with the Vikings’ speedy backs and receivers, and this one was over quickly. A week after we broke down the Vikings’ imbalance in Carolina, quarterback Case Keenum again thrived in a balanced approach. Keenum posted another 100-plus passer rating, highlighted by his decisive 20-yard touchdown throw to Stefon Diggs. That was just one of the Vikings’ seven gains of 20-plus yards, or “explosive plays” in NFL vernacular. Five of those seven “explosive plays” were product of the Vikings’ speed and play designs, particularly involving running back Jerick McKinnon and receiver Adam Thielen. Two-thirds of the Vikings’ passing game — 159 of 236 yards, to be exact — came after the catch. Let’s take a look at how the Vikings offense is creating space for its playmakers, a key to Sunday’s 34-7 win against the Bengals. Typically here to help is Dan Hatman, a former NFL scout and Director of Scouting Development at The Scouting Academy. We’ll give him a bye week. Still follow Dan on Twitter @Dan_Hatman. This play created 52 yards on two third-down conversions for the Vikings. The play design charts a couple Vikings targets into the same areas of the field, which bunches up defenders and creates space. On this third-and-3 (above and below), Thielen motions out of a bunch set to the left side, giving Keenum a pre-snap read on the Bengals coverage. They’re playing zone. The three routes to the right (in green) will eventually occupy the three Bengals linebackers, freeing Thielen underneath for the 21-yard gain. Thielen entered Sunday ranked 5th in the NFL with 386 yards after the catch this season. The Vikings went back to this play late in the third quarter. On third-and-2, Keenum throws to a wide-open McKinnon as Diggs gets in the way of safety Clayton Fejedelem (42). McKinnon gained 31 yards on this play (100 of his 114 receiving came after the catch). The Vikings’ screen game continues to produce, with Latavius Murray’s 28-yard catch and run kick-starting Minnesota’s opening drive. Center Pat Elflein hit a couple bumps in his return from a shoulder injury, but this wasn’t one of them. On second-and-19, Murray subtly slips out of the backfield and sets up his blockers. The Vikings want Elflein to get stronger moving forward, but they’re taking advantage of whatever speed gained from being on the leaner side. Murray follows Elflein for nearly 10 yards before cutting toward the sideline. Simple man coverage-beating releases like this third-and-9 play below have also allowed Vikings receivers to thrive after the catch. Diggs motions, again allowing Keenum to get a read on the coverage. The Bengals are playing man-to-man with corners up at the line, which means tight end David Morgan’s release in front of Diggs should buy the receiver a few steps. Diggs got an acre and a first down, but an illegal hands to the face penalty on left guard Nick Easton nullified the play.